“I wrote it for breakfast, recorded it for lunch and we’re putting it out for dinner.” That’s the way John Lennon told the story of “Instant Karma,” one of his most memorable songs. It was his third single as a solo artist to appear before the official breakup of the Beatles. The only exaggeration in John’s description was the part about dinner. 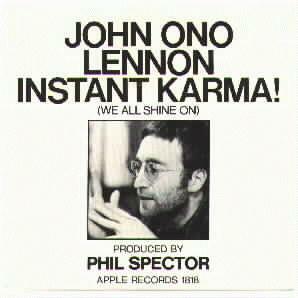 “Instant Karma” wasn’t actually released to the public until 13 days after it was written and recorded. This happened over the course of a single Tuesday, on January 27, 1970. By any measure, it was one of the fastest pop songs ever to come to market. “Instant Karma” came during a tumultuous time for John and for the band he would soon leave behind. The Beatles had spent the better part of 1969 trying to decide whether or not they were still a band. They abandoned recording sessions that had just begun. And they canceled plans for their first live performances in more than three years. The material for both of the band’s last two albums—Abbey Road and Let it Be—was recorded that year. However Let it Be sat unreleased and without an agreed-upon producer. Lennon, meanwhile, was moving in a new direction. “Give Peace a Chance,” had already come out under the name “The Plastic Ono Band”. “Cold Turkey,” his wrenching account of kicking heroin came out that same year. By January 1970, John had walked away from the Beatles. 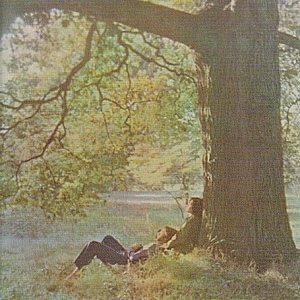 The from down Plastic Ono Band was the only musical entity he considered himself part of. The January 27 session came about spontaneously. Lennon wrote the song that morning and, as he said, “I knew I had a hit record.” What got the record finished that same day and gave it its incredible sound, however, was the unexpected appearance of Phil Spector that evening in the EMI studios. After several run-throughs under Spector’s direction, John said, “Suddenly we went in the room and heard what he’d done to it…it was fantastic. It sounded like there was [sic] fifty people playing.” John’s happiness with the results would lead directly to Spector’s taking over the dormant Let it Be project—a development that ended up driving a further wedge between Lennon and McCartney prior to the official breakup of the Beatles. I wonder, sometimes, what John might have done with his life. He was definitely on a quest.